Clea's Cave: "Pretty Cunning, Don'tchya Think?" 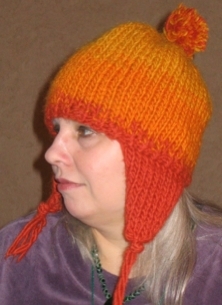 My friend Francine adapted the directions found here to replicate the hat Jayne Cobb's mom sent him in "The Message" Firefly episode. Forget my non-photogenic eyes and lack of chin; the HAT rules, right? The yarn she used is very cozy and a little more muted than some i have seen - easier on the eyes, and more like Jayne's. Check out this page in Craftster to see someone modeling a lovely version. 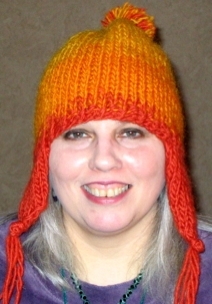 If you're not crafty, someone will knit one for you at Jayne's Hat Brigade. 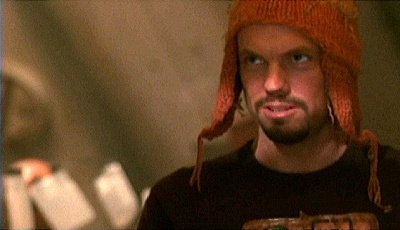 It perfectly matches my winter coat, but the essential purpose is to show up at the Serenity premiere September 30th joining an ocean of very fine hats. Hey Juana -- Your eyes are actually open!!! Nice photos! Way cool hat (as usual), Franciney! You are truly the hero of Canton now!